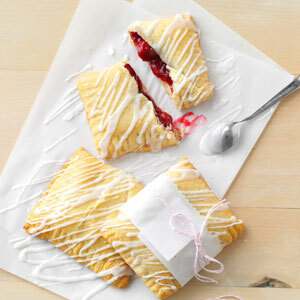 In honor of National Cherry Turnover Day try these quick and easy cherry turnovers courtesy of Taste of Home. Preheat oven to 375°. Unroll crescent dough and separate into four rectangles; place on an ungreased baking sheet. Press perforations to seal. Place 1/4 cup pie filling on one half of each rectangle. Fold dough over filling; pinch edges to seal. Bake 10-12 minutes or until golden. Place confectioners’ sugar in a small bowl; stir in enough milk to achieve a drizzling consistency. Drizzle over turnovers. Serve warm. Yield: 4 servings. 1 turnover equals 359 calories, 12 g fat (3 g saturated fat), 1 mg cholesterol, 459 mg sodium, 56 g carbohydrate, trace fiber, 4 g protein. This entry was posted in Health and tagged #easyrecipe, #NationalCherryTurnoverDay by Sage Robinson. Bookmark the permalink.